Backup is very important but is not complete if you simply save the backups on the same machine. If the server is hacked and the the hacker deletes both the data and backup, everything is lost. The same situation is also possible if a nasty virus is programmed to delete everything on the hard drive or even an unpredictable hard drive failure can cause you to lose everything. That is why it is important to have an offsite backup where the backups are stored outside of the server so no matter what happens to the server, you can restore the data to another server anytime. A lot of backup scripts can do offsite backup by uploading the backups to another server via FTP. This method is called push backup and it seems fool proof but if a hacker that managed to hack in the server can also obtain the FTP login credentials. Which means they can connect to your FTP server, download your backups and even deleting them. So the best method to backup your server files and databases is by using pull back. I have been looking for a very long time and finally found myRepono which does pull backup and store backups at an affordable price. The backup method used by myRepono works the other way round with their servers connecting to your server and downloading the files and database specified by you, then storing it for a duration that is also set by you. With this pull backup method, hackers won’t have access to your backups even if they managed to hack their way in to your server. 1. After sign up, go to Domains tab and click Add New Domain. 2. Enter your domain URL and click the Add Domain button. 3. Next you will need to install a small, simple and secure program on your web site, which enables myRepono servers to connect to your sever in order to retrieve file and database information. There are 3 methods to do this and the easiest is by using the automatic installation method which requires you to enter the FTP information so that myRepono can install the script for you. In fact at a later time you will still need to provide myRepono your FTP login information or else you cannot transfer files bigger than 64MB. The FTP details stored at myRepono are using 256-Bit AES encryption. 4. After installing the API and it shows connected, then you can now go to the Files tab to select the folders and files that you want myRepono to backup. You can also backup mySQL tables and databases at the Database tab but you will need to provide the database name, username and password. 5. Once you’ve done all that, go to Overview and click the Backup Now! button to manually run a first time backup so that you will get an estimated backup size and cost. 6. When the first time backup is successful, go to Settings and the page will show the estimate backup size and estimated cost. 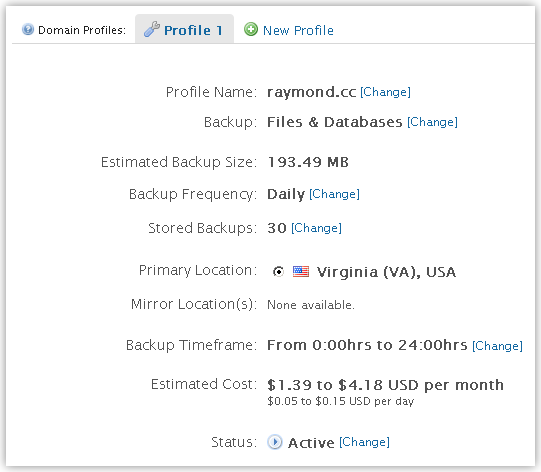 Changing the backup frequency and stored backups value will instantly calculate and display the new estimated cost. When you are comfortable with the amount that you’re willing to spend on the backup, make sure the Status shows Active (if not click the change link) and then click the Save Settings button. 7. 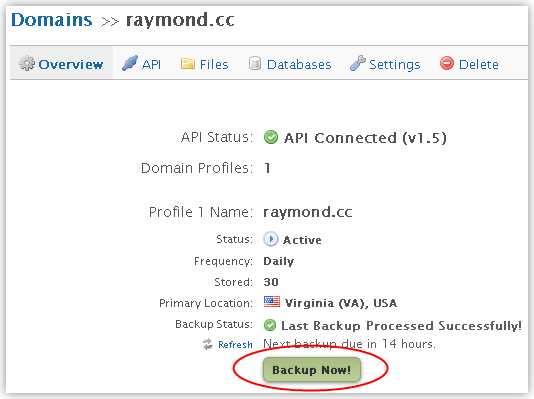 You can view, download and restore your backups from the Backups tab. For your information, your backups on myRepono servers are encrypted with their own custom encryption algorithm used for improved efficiency, compatibility and reliability. Alternatively, you may choose to enable Rijndael 256-Bit encryption for optimal security if your server supports the mcrypt library/extension. At only $1.39 to $4.18 USD per month for daily backup frequency with 30 days backup storage, I would say that it is a good deal to put my mind at ease. No matter how useful myRepono is, nothing is perfect and no one cannot guarantee if myRepono will ever get hacked or the company will get shut down. So it is still your responsibility to download the backups to your computer at least once a week and burn them to CDs. I’ve also tested other website and database backup companies such as CodeGuard, Backup Machine and Dropmysite but ended up going back to myRepono. Haven’t tried it yet but I might give it a try on my client’s website that runs on WordPress. Thanks for the suggestion.